Paris, France: Europe & Middle East Politics: Are My Life! Driving around with Juan Luis Buñuel in Paris! From Mid 1980s Iran Arms Deal: Close friend of My Dad, Mr. Manucher Ghorbanifar, answers questions from American reporter Barbara Walters, while friend Adnan Khashoggi listens in. New Figure in Iran Arms Deal: December 11, 1986, My father is introduced to the world for tipping off the CIA Director and personal friend William Casey, that funds were missing from the deal. Where usa was trading weapons to Iran to free American Hostages. Local Channel ABC 7 NYC: Iran Contra Affair, also introducing Dad. Also in this clip a short clip/interview of family friend the late Mr. Adnan Khashoggi, on his plane as he answered questions from Barbara Walters. My Dad has told me he was on Khashoggi’s plane couple times..
A World Apart: On The Moon & Middle East Events, Hitting Home Again! On January 8, 2017, the world learned of the passing of the former President of the Republic of Iran, Akbar Hashemi Rafsanjani. He had died due to complications from a heart attack. Then a little more than a week later, an American hero moon walker, Eugene Cernan, Astronaut died today January 16, 2017 at the age of 82. Two very different men, with vast different lives and cultures behind them, yet still; these two unlikely men, have some unusual personal connection to me and my life, all thanks to my Mom and Dad. Former President Akbar Hashemi Rafsanjani of Iran, was the cousin of a personal close friend & business associate of my father. This business associate was Cyrus Hashemi. 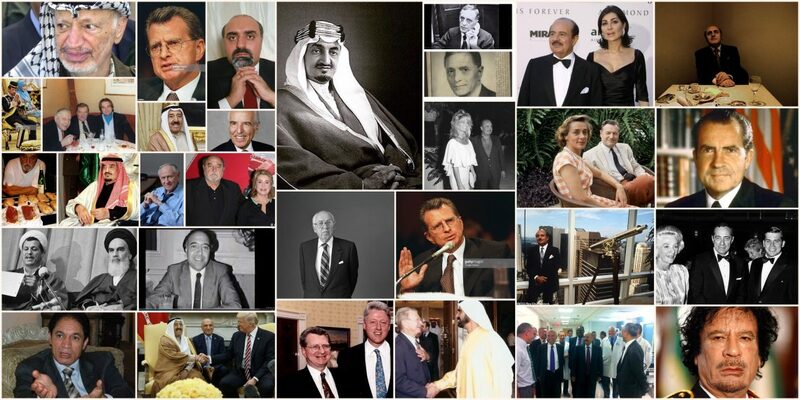 Hashemi had known my father’s boss and close family friend as well, Lebanese financier John Shaheen, of Ring Free Oil Corporation in Newfoundland, Canada during the mid to late 70s and early 80s. He not only had ties to my father and Shaheen, but Hashemi thanks to Shaheen, was a familiar name to other former prominent American figures, Former United States of America President, Richard M Nixon and former Central Intelligence Director, William J Casey. There was a long history between Shaheen and my Dad, and frankly it was this deep, personal and yet professional relationship that was the platform of my father’s own prominence. Gradually, as the years progressed and business deals came and went involving my father, it was often Dad who often knew all the right people to do business with, pertaining to each specialty of whatever deal was at hand. In fact, one of my favorite examples occurred in July 1985. When it was through Dad’s close connection of Cyrus Hashemi, who was able to set a meeting in Israel with the then former Prime Minister Shimon Peres. I will never forget that black medium sized telephone book that my father always had. It was the treasure trove of, some could say; the private and or personal phone numbers to the most powerful people on the globe, with a more likelihood of Arab connections within the Middle East. Whether being witness to this black telephonebook, and all the loose small little ‘notes’ and papers that may have had a scribble of some prominent person’s contact information, the fact is that my father was known for having some of the most powerful & prestigious contacts within the Middle East. Most often it would entail personal and private information of some prominent World Political Leader, or someone who was close to one. And in this case, Cyrus Hashemi was all that in ‘one’, at least with regards to doing business with Iran. He was the cousin of former Iranian President Rafsanjani. It was then during the 1980s when this sort of news and activity was more prevalent for my father and in turn our family being familiar or maybe hearing bits and pieces of all the dealings that may have been going on at the time. Or perhaps I should say, hearing only ‘one end’ of any particular phone call. In fact, some of the ‘code names’ I will never forget. Code names like: “Eagle”, “The Beard” and such…I guess it almost could’ve been some spy like International film, yet this was all real life, and it was my life! Sadly, I would have to admit that it wasn’t really until after the passing of my own father, did I then become even more actively curious to all this extremely interesting political information. Yet, when I look back to when I heard the news this past January 8, 2017 about the former President of Iran passing away, and seeing his picture, of course this all rang a bell with me. Wow! I thought to myself…Who else had this sort of personal, yet private information about a former Middle Eastern World Leader? Well, ok…maybe it wasn’t so much that I ‘had’ any personal information. Rather, I had the ‘inner happenings’ of some event that would eventually be written about in numerous world newspapers, at least back then in the late 1980s. To think, that the idea that if I could’ve gone back in time, it was very plausible that I could’ve contacted Cyrus Hashemi, and then connect with, or get closer with, or perhaps set up a meeting with the former President of Iran? Well, of course just saying that, and reading this sentence to myself now, it seems almost nuts. But, sure it sounds so far fetched when I put it that way today. But my point is, the thought of that being a real reality back then in those times, actually was more realistic than anything else. THAT, is what is so crazy about this and thus, in turn how unreal my personal life overall could’ve seemed to many others who really maybe couldn’t ever grasp the magnitude of everything pertaining to my dad and our family life at home. Then today January 16, 2017, on a completely different topic the world heard the news about former Astronaut Eugene Cernan. Cernan was the one who also walked on the moon way back when. Well, as my handicap Mom and I were watching the news this evening, sure enough she sort of giggled and laughed and said to me: “I knew him and his wife Barbara, personally”. Then almost within an instant, it did make as if a ‘light bulb’ go off in my brain. I do remember many times in the past both Mom and Dad would often talk about their knowing him and how they got to know him and his wife Barbara while at the inauguration for Nixon. Once again, Mom and Dad got to know Eugene Cernan from Dad’s former boss and close family friend, John Shaheen. As mom reminded me tonight, they got even closer during the inauguration of President Richard M Nixon. Mom told me, that during that time, Cernan had ‘not yet’ been to the moon. Yet, once again…the privileged life of my Mom and Dad had once again opened up such opportunity that no one could’ve ever planned or set up. No, not at all. All thanks to my Dad’s career, and well, that and a little ‘luck’ too perhaps. The idea of knowing such important political figures: Richard Nixon, before he became President also through Shaheen. Then William J Casey, before he became former CIA Director. And now Eugene Cernan and then Cyrus Hashemi and many others as well, this is seemingly how things just happened to work out for my Dad, and in turn playing some sort of interesting ‘side note’ to our personal lives today. It really is so amazing how much I have personally learned about the world overall throughout the years. And the way it has such a profound and personal impact on me and my personal life, with regards to this knowledge, it has helped me to have a much better understanding of today’s world! Sure, to you the ‘regular’ person who came across this article/blog, it may be sort of interesting to you, depending on your personal interests, but I too still am quite overwhelmed when I sit and think long and hard about all this stuff. I do feel privileged and I actually wouldn’t want it any other way. In this day and age of news and detailed information of worldly events, or those prominent people passing away perhaps, it then brings me to a very scary place. I fear for that time when my last connection to such amazing personal history and background, my mother, pertaining to my parents past and often at times interesting knowledge of such important events, being lost during that time when my mom’s time will end. I know this is of course a part of nature, but it still scares me, big time! 😦 Of course, I am fully aware that this time will sometime eventually come, but even though my mom is 80 years old and handicap, I keep praying that she will hold on for few more years or so. She is surely my avenue to learning more about my own background, pertaining to her and or my Dad, and absolutely I find all this so interesting and yes, as I said; a privilege to have this in turn be a apart of me and my life’s history! Whatever the case may be, at least I was able to have the life that I did, where I was immersed with all of this. Most people aren’t and sadly, most people could care less about this sort of information and news unless they were to go ‘out of their way’ to take interests with such topics like this, or anything else that would ‘not’ be considered the ‘norm’ to most. Although in a personal thought, I feel people should take initiative and should go out of their way to learn about this detailed info. Why? Because, a lot of the terrible events that we so often hear about on the news today in 2017, are often having to do with terrorism. And the only way to better understand this wide and broad topic, and perhaps try to make changes in our lives to prevent it, will take education. Even if a ‘skimmed view’, it’s better than nothing at all. After all, one can’t always use the propaganda term of “they hate us because of our freedoms”, because its ‘not’ true. It’s more complicated than that, and thus, why I’m lucky that I have this inside education, where most people have no clue. In conclusion, I would have to say a big ‘thank you’ to both my Mom and Dad for, well…being my parents. I thank them for giving me the life they did, even if it makes more sense that it was all pure chance and luck. I’m glad it was me and no other. Because, I am someone who takes pride in this knowledge and from all of this history, I do take a more active stand to what is going on in the world we live in presently. I can relate to all the horrible events that we may hear about or see on our televisions or radios. A lot of it does makes sense to me, even if the general consensus is that it’s ‘not’ supposed to make sense. That’s just it. The world is complicated and there are a combination of reasons why things are the way they are today. There is a lot of personal struggle in the world, from Palestine to Syria, to Yemen and other places. I become more sad as a reminder that my father is no longer here with me. I am more than positive that he would’ve had once again, some kind of close, personal connection to what is going on right now in many areas of the world today…. but, I can face my reality. I know he is ‘not’ here now, nor ever will be. Therefore, I have learned that it must be me, who takes the initiative and time to learn and or try to find out myself about all the worlds problems and better understand the anger and yes, even deaths that happens from wars or even terrorism. There is nothing black or white in this area. It’s always a little grey, everywhere. In the end,…. there is an answer, even if it is one that we do not like or personally desire. Yet, it may be the only answer around – and thus, we need to do all we can, to make understanding of all the knowledge there is out there, from our lives to something that can be a threat to us all in our every day lives or not. With the troubles of life come the celebrations of life as well sometimes. And from losing the former President of Iran, and then losing the former Astronaut – we can see, in every day life, there will always be a combination of both good and bad, happy and sad, life and death. We just need to keep things in perspective. And regarding my personal life, …I can only say; Thank You, to my Dad and Mom, for making this all possible…even if the majority of it, occurred from chance or luck. I learned from all that you lived, and I can only do as much as I can, to make all that I learned, be effective for the better understanding of the world we are in today. Thank You, for everything, Mom and Dad. You made me lucky, in this sense, of becoming so knowledgeable with a wide variety of events. Thank You, for giving me the life you did. NEW YORK CITY LOST AN ICON ON MARCH 19, 2017: 88 YEAR OLD ‘SON’ JIMMY BRESLIN: AGAIN, I HAVE PERSONAL TIES TO THIS NATIONAL HEADLINE! “Where’s My Baby”? The Blood-Curdling Scream Of Pan Am Flight 103 Victim’s Family Member: 30 Years Ago Today Is What Has Stayed With Me! ADNAN KHASHOGGI: ONCE THE WORLD RICHEST PERSON & CLOSE PERSONAL FRIEND TO MY DAD…..HAS DIED! ABC NEWS NIGHTLINE: Hashemi Brothers, Khashoggi, Dad. In this clip Ted Koppel Calls Dad “Canadian Businessman” by mistake.